Garmin Virb Ultra 30 review: Action cam Hero, or GoPro-imitating zero? We think the Virb Ultra 30 is a decent little action camera. It's incredibly easy to use, with a simple and intuitive touchscreen interface, plus it delivers excellent video and photo quality up to 4K resolution. When you think action camera, you probably think GoPro. But Garmin wants to change that with the Virb Ultra 30, its top-of-the-line 4K action cam. With considerable fitness gadget clout under its belt, Garmin has brought much of this experience to the Virb Ultra 30: including altitude, speed and location measures to make those videos altogether more exciting. Can Garmin out-muscle the current Hero? Take the Virb Ultra 30 out of its box and you'll soon realise just how small it is. Much like the GoPro Hero5, this thing is tiny, with only a few millimetres of difference between them. On the front of the Virb, next to the protruding lens, is a small squared grid - which is Garmin "doing design", we suppose, as it doesn't serve any purpose. Otherwise the black and red finish hosts Garmin branding both front rear, keeping the look simple and effective. On top of the Virb Ultra 30 you'll find a power button, a button to connect the device to your smartphone via Wi-Fi, plus a switch to start and stop recording. On the left hand side when looking at the screen there are ports for Micro-HDMI and Micro-USB, while the right has a switch to open up the battery cover on the bottom. The 1,250mAh battery is removable and this is also where you'll find the microSD card slot. On the back is where you'll find the 1.75in touchscreen, which can still be used with the waterproof case on. This case is included within the box, making it possible to kit out the Virb so it's waterproof down to 40 metres. However, we did have a bit of a problem with ours when we took it into the sea: it kept the camera dry, but it did pick up a bit of sand which clogged up the opening mechanism. This meant we couldn't get the camera out without digging out the sand - using a rolled up bank note to improvise (outlandish party people that we are). Dust, sand and grit? Not so much. Water? No problem. If you plan to use any mounts with the camera - such as strapping it your bike handlebars or chest - you'll want to keep the waterproof case on, as this is the part which hosts the mounting points. The display to the rear of the Virb is a touchscreen, which makes it easy to tap away to adjust those settings. The panel may not be quite as large as the GoPro Hero 5 Black's 2-inch screen, but it serves up a clear image with good brightness levels to deal with pesky sunlight. There are six soft buttons on the home screen for video, photo, playback, presets, wireless and display. Garmin has even managed to squeeze in a back button and a settings icon, too, to help with navigation. Considering the size of the display, these buttons are a good size and easy to press. The display offers a couple of quick settings too, by swiping from the left to access video and photo settings, or from the top to access connectivity settings. Just like you can find on the GoPro Hero5 Black, the Virb Ultra 30 offers voice control. This means that if you've got the camera, say, mounted to your bike handlebars and don't have your hands free, you can bark commands to the camera to get it to start and stop recording. Voice commands include "OK Garmin, start recording," and "OK Garmin, remember that," so the Virb Ultra 30 will put a tag into the recent recording for easily re-locating an important moment when you come to import to a computer. Once you've given a command, the camera will make a beep sound to confirm it has understood the command and will carry it out. If you don't hear the beep, it means the camera hasn't been able to understand what you've said - or maybe the surroundings are just too loud. Fortunately, we didn't experience any such problems, with the Virb Ultra 30 always being able to pick up our voice, even in noisy and windy conditions. Response time to the commands we gave was impressive and it's pretty good when it comes to understanding different phrases. For example, ask it to take a picture or take a photo and it will produce the same response. However, some voice-controlled cameras require you to give the exact programmed phrases, which needs to be learned rather than feeling entirely natural. You can also connect the Virb Ultra 30 to your smartphone via Wi-Fi. You'll need to Garmin Virb app installed - it's available for iOS and Android - and can use it to see what the camera is seeing on your device, change video and photo resolutions, view the battery level, access the content stored on the camera's memory card and even live broadcast to your YouTube channel. You can also connect the camera to a smartwatch for remote control, along with a variety of third-party sensors such as heart-rate monitors, to add extra data to your videos. The Virb Ultra 30 also has something very Garmin as part of its spec: G-Metrix. This allows the camera to measure various data which can be placed on top of your video. With the feature turned on, you can measure your altitude, speed and location - thanks to built-in altimeter, compass, accelerometer and gyroscope - to prove to your family and friends you did 'board as fast as you said you did down a slope. 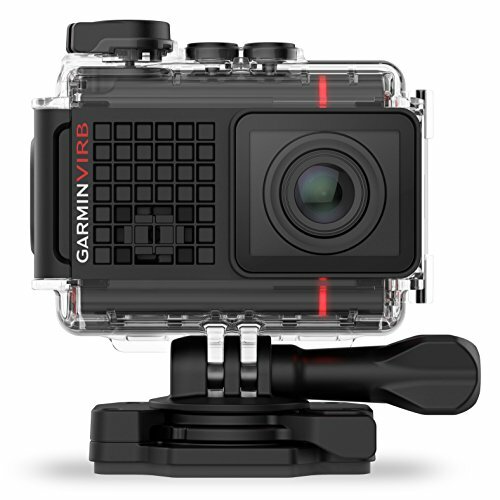 Another standout feature of the Garmin Virb Ultra 30 is the ability to record video in 4K at 30fps. You will of course need a device which can display 4K resolution (3840 x 2160) for the best playback, but nevertheless the resulting footage is incredibly clear and detailed. Here's one area where the GoPro Hero 5 steps ahead if you're in for Full HD capture, though. As that camera offers 120fps at 1080p, it opens itself up for better slow-motion editing - if that's your thing. If you don't have a computer or the tools to fiddle around with more advanced editing then this might not matter to you, but the Garmin is only churning through half the frame-rate equivalent. One other thing we would like to see on the Virb Ultra 30 is a wind noise blocker. The GoPro Hero5 Black has this feature, which works a charm. A lot of our footage happened to be shot in windy conditions, and while it didn't necessarily prevent us from hearing speech, the typical "wind tear" did take away from the main focus, which was some stunning scenery. The Garmin Virb Ultra 30 will take 12-megapixel photos with a 4:3 ratio, or 8MP photos in 16:9. It also offers some "Pro Settings" that include manual adjustment of the ISO sensitivity and exposure, including real-time live preview. It won't rival a dedicated digital camera or DSLR of course - not least given how mucky our lens got when splashing it about in all kinds of conditions - but for quickly capturing a shot (and you can take pictures whilst recording) the Virb Ultra 30 is a commendable performer. Last up, the crucial thing: battery life. We found the battery life to be just under the 2-hour mark, but this will differ depending on what resolution you're shooting and which settings are active. Use 4K with G-Metrix and don't expect it to be so long. Drop to 1080p with G-Metrix off and Garmin's quoted 2-hours and 15-minutes of recording time is agreeable - and that's typically better than what you'll get from the GoPro equivalent too. Garmin supplies the camera with a waterproof case and a range of mounts which only add to its appeal and the connectivity options on offer are a great addition and genuinely useful. Is the Virb better than the GoPro Hero 5? Well, it doesn't offer anything distinctive over the GoPro and it costs the same. Technically there are a few things lacking in the Garmin too: the GoPro offers higher frame-rates, better wind-resistance for sound capture, and easier-to-use software when it comes to pulling all your footage together. That said, the Garmin Virb Ultra 30 is a solid action cam attempt, but it would need to considerably undercut on price for it to be considered an all-new action cam Hero. You knew it was coming. We've mentioned the Hero5 plenty in this review, for the simple fact it's king of the hill in the action cam world. It's better in every department than the Garmin, except for battery life.